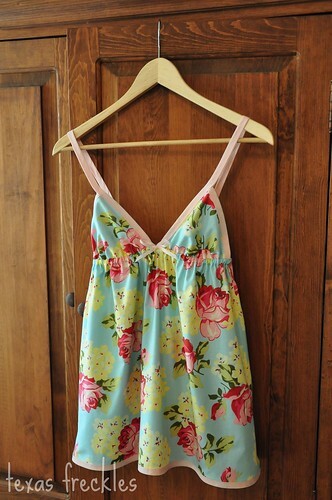 I finished the Summer Nightie from One Yard Wonders this afternoon. I love this fabric, but it's not something I would ever decorate with (it's just not right for my home) and it's not something I'd wear out during the day, so I thought this would be the perfect project for it. I can't wait to wash it so it gets all soft and cozy. The nightie itself is really short on me, so I think I'll make the little sleep shorts to go with it. I have plenty of this fabric. 1. I made the small and if you use packaged bias tape, it will take every inch of the 3 yards in the package; there's nothing to spare, so be careful. 2. The small triangles (which create the top) are really small. It fits me fine, there's just not a lot of coverage, if you know what I mean. 3. If I did this project again, I would cut four triangles for the top so I could make them lined and have a place to hide the seam allowances by folding them up inside the triangle and blind stitching it closed by hand. I just made this top as well, you are right about the bias tape, I must have been too generous when making the top and as a result ran out of tape for the bottom. I ended up just hemming the whole thing. If I could go back I would have just made the bottom a little less wide to accomedate my mistake.